Camp Awesome is a special event we do every summer for Adam’s youngest siblings. We set aside a few days each summer to have each of them stay with us and do a lot of fun things here in the Twin Cities. We leave it up to them to choose what we do each Camp Awesome. We’ve found that they’re just looking to do things that their hometown can’t offer. Azure came to visit us the first week in August. We got to do a lot of things with her that we had never even done in the Twin Cities. While Adam was still at work, Azure and I took a trip to Linden Hills to hang out at Wild Rumpus. Wild Rumpus is an amazing book store, specializing in children’s literature. It’s in an older building with creaky wooden floors which make it feel like a club house. It also has a special half-height front door designed just for kids (adults can use it too, but most opt for the regular door). A wide range of pets call Wild Rumpus home too including cats, chinchillas, ferrets, pigeons, a lizard and chickens to name a few. Azure and I played Ticket to Ride before Adam got home. After dinner, we all played Just Dance 3 together on the Wii. We started out the day with some coffee coolers and breakfast sandwiches at Caribou Coffee while enjoying a good book. Azure has been hunting for good books to read all summer and luckily she was able to find a few that she was excited about from our home collection. Next we headed over to Mall of America to spend some time at the Sea Life exhibit (formerly Underwater Adventures). The new exhibit has a greater focus on ocean and tropical sea life than freshwater or Minnesota sea life. Azure and I enjoyed petting the starfish and urchins, while Adam was overjoyed to see a horseshoe crab. Azure had yet to see the newest addition to Nickelodeon Universe — the Anchor Drop. This is a set of slides that are connected to the Ghostly Gangplank ropes course. Although you can do both, you can also pay to ride just the slides. We grabbed some lunch at Noodles & Company, and then had some dessert at Freeziac, a frozen yogurt shop. We treated ourselves to things like cake batter frozen yogurt, brownie bites, hot fudge and gummy bears. After a little bit of shopping, we went to the Waterpark of America. Adam and I had a few free half-day passes to use up so that made our visit a lot more affordable. With it being the start to a weekend, the waterpark was fairly busy but we still had a good time on the lazy river and tube slides. We returned back to the Mall of America to hunt out a One Direction shirt for Azure. This ended up being more of an expedition than we were expecting but in the end we found one. Our night ended by ordering Topper’s pizza and cheese sticks, and watching “How to Lose a Guy in Ten Days”. After a late breakfast of pull-apart cinnamon rolls, we packed up for a trip to the Minnesota Zoo. Our first stop was the Aveda Butterfly Garden. The butterfly garden is a screened greenhouse with many varieties of butterflies, moths and wildflowers. They have boxes that house cocoons and chrysalises so you can see hatching in progress and watch the newly-hatched butterflies and moths stretch their wings for the first time. They have peaceful garden music playing while you wander. If you stay relatively still, a butterfly with land on you. Azure’s favorite exhibit is the dolphins. 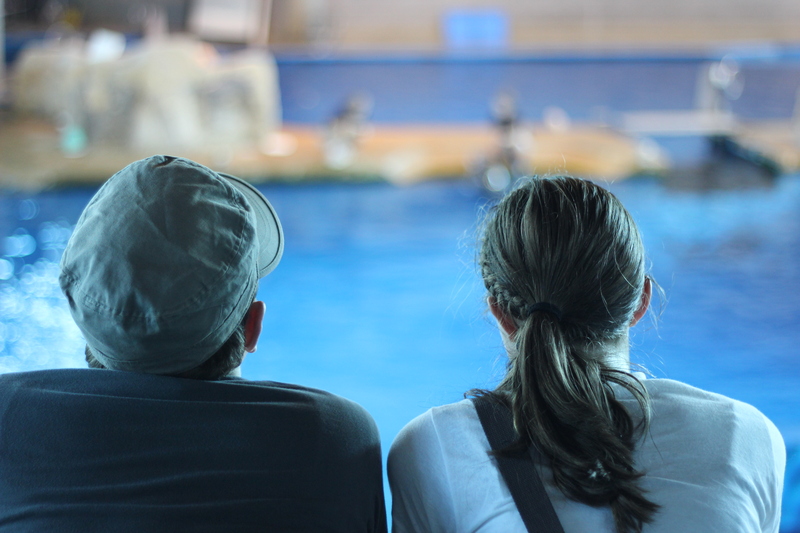 The zoo is closing its dolphin exhibit this fall to perform repairs so we made sure to spend a lot of extra time watching the dolphins. Luckily they were just beginning an informal snack and play time with the dolphins. We got to see them munch on ice cubes with goodies frozen inside, and toss toy floaties around. We also made sure to spend time with one of Adam’s favorite animals–the cuttlefish. Sadly, the cuttlefish doesn’t photograph well; this is the best I could get of him. Next we hit the Northern Trail to see the grizzly bears, Amur leopard and tiger, Dhole, and many others. The grizzly bears are one of my favorites. I love to watch them when they are swimming or wrestling. The grizzly bears were quite excited by an aide dog that was at the zoo. They were roaring and trying to get at it through the glass wall. We were able to see the leopard and tiger cubs via video feed, and the Dhole pups were out frolicking in their pond and wooded area. Many of the animals were not out and active on the Minnesota trail but we were able to catch sight of the wolverine and lynx, as well as another one of my favorites — the soft-shelled turtle. We grabbed a quick bite to eat for dinner before heading to the Cottage Grove drive-in. This drive-in will be permanently closing at the end of the summer so we were glad to check it out. They had the perfect tween line-up: “Diary of a Wimpy Kid: Dog Days” and “Ice Age: Continental Drift”. Azure was able to catch-up on part of the book series while we waited for the movie to start. We all especially enjoyed “Diary of a Wimpy Kid”, and are glad to see the movies getting better and better with each new installment to the series.